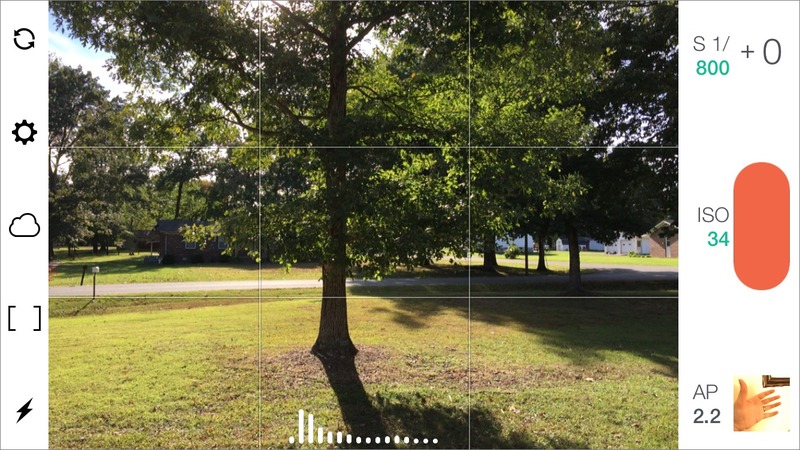 “This is an amazing camera, but sometimes it can be %$#&@^% stupid,” says developer William Wilkinson in the introductory video to Manual, a new camera app for iOS 8 that provides nearly complete control over your iPhone’s camera. Wilkinson has a point. I’ve often found myself struggling to tell the iPhone’s camera exactly what to do, especially when it comes to what object in the scene I want to focus on. But for a mere $1.99, you now can take complete control of your iPhone’s camera. A bit of a disclaimer: My skills are nowhere near those of photographers like occasional TidBITS writer Charles Maurer or our own Jeff Carlson. I struggled through my university’s photography class, eking out a hard-fought C. But, as I noted in “Canon EOS M Combines Quality and Simplicity at a Low Price,” (23 August 2013), I’ve managed to learn enough to take some decent baby photos. Aperture: In simple terms, the aperture determines the size of the hole capturing light. Aperture is measured in f-stops, and the smaller the number, the larger the hole. So an aperture of f/1.4 is much larger than f/8. A lens’s stated aperture size is the largest size it can open up to. So if a camera lens is rated at f/2.5, that’s the widest it can open, and the most light it can let in. ISO: Referring to the ISO 5800:2001 standard, the ISO setting on cameras determines how sensitive to light the film or digital sensor is. In the days of film, ISO was determined by what film you had in the camera, but in the digital era, it’s a software setting. Higher ISO settings capture more light, but also introduce visible noise. Ideally, you want to use the lowest ISO setting you can get away with to minimize noise. Shutter speed: How quickly a camera’s shutter opens and closes is measured by its shutter speed, in fractions of a second. The faster the shutter, the less light is allowed in, and the less risk of image blurring. A slow shutter speed lets more light in, but since the exposure is longer, any movement of the camera or the subject will result in blurring. At one time, you had to be familiar with all of these fundamentals — and how to adjust them on your camera — to take a decent photo. But even with most cameras now attempting to be idiot-proof, understanding these basics enables you to pull off some neat tricks. For instance, if I’m trying to photograph an active baby in a dimly lit room, I know I need to max out shutter speed, open my aperture up as wide as possible, and increase ISO. If I wanted a motion blur effect, I would slow down the shutter speed, but since that causes more light to be captured, I would also tighten the aperture and reduce ISO. Until iOS 8, Apple didn’t permit such control over the iPhone’s camera. The iPhone’s processor (and the dedicated image processor in recent iPhone models) automatically selects the settings to make the best image it can, and usually does a good job. But now, thanks to the increased freedom offered to developers in iOS 8 to control those aspects, an app like Manual has become possible. But does Manual deliver on its tantalizing promise of offering complete, SLR-like control to the serious iPhonographer? Yes and no. You probably noticed the big omission: aperture! Unfortunately, the iPhone’s camera has a fixed aperture: f/2.2 on my iPhone 6. Since adjusting the aperture is a key way to control exposure, I can’t do many of the things on my iPhone that I can on my Canon EOS-M. I have a simple camera trick I like to use for testing. To capture a motion-blur effect, I slow down the shutter speed, adjust aperture and ISO as needed, and then wave my hand in front of the camera while snapping a picture. 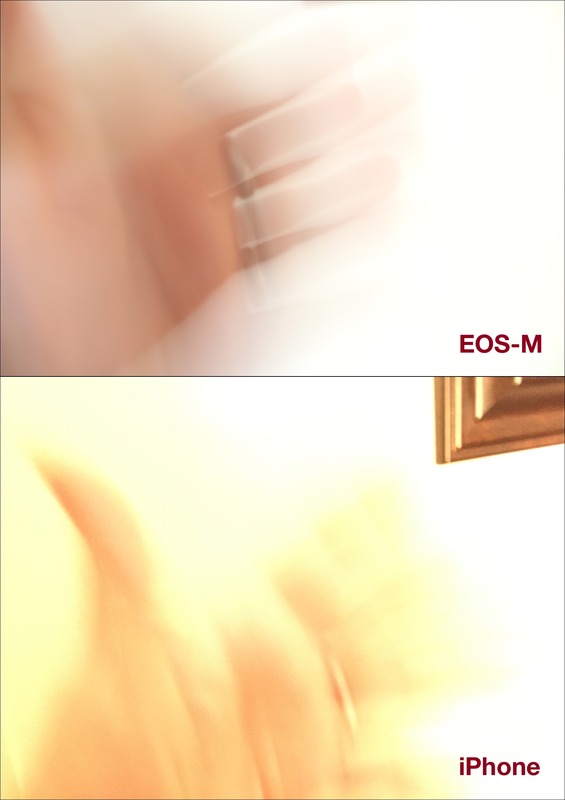 On the EOS-M, this is easily accomplished. However, with my iPhone 6 and Manual, it’s a lot more difficult. Since I can’t control aperture, it’s easy to blow out the image with too much light, resulting in a white rectangle instead of a picture. I was able to pull off a similar effect on both cameras, but it took some trial and error in Manual. Of course, this hardware limitation is outside the Manual developers’ control. But I have a few other issues as well. Sometimes, touch targets are unresponsive, which, to be fair, seems to be a common bug with apps on the iPhone 6 and may thus be iOS 8’s fault. Also, when I dial down the shutter speed, the viewfinder responds in kind, displaying jerky video of what I’m looking at. While it sort of makes sense, no other camera I’ve used does that, so it’s disconcerting. Finally, Manual doesn’t have a… manual. Just a terse FAQ. I think a lot of amateur photographers would appreciate at least an overview of what each function does. If you’re interested in iPhone photography, you’ve probably already dropped the $1.99 to start playing with Manual. I don’t blame you. In fact, I fully expect much better photographers than I to do amazing things with it — I’ve been impressed by what people have been able to squeeze out of even earlier iPhone cameras. But set your expectations accordingly. While the iPhone has an amazing camera for a phone, it’s still a phone camera. But if you’re not a photography buff, you don’t need Manual. The iPhone 6’s camera and image processor combine for better photos than I could take with my iPhone 5, and in iOS 8, you can adjust exposure and focus by tapping objects in the viewfinder screen. If you just want to pull out your iPhone and snap a decent-looking photo without manual intervention, the built-in Camera app is tough to beat.